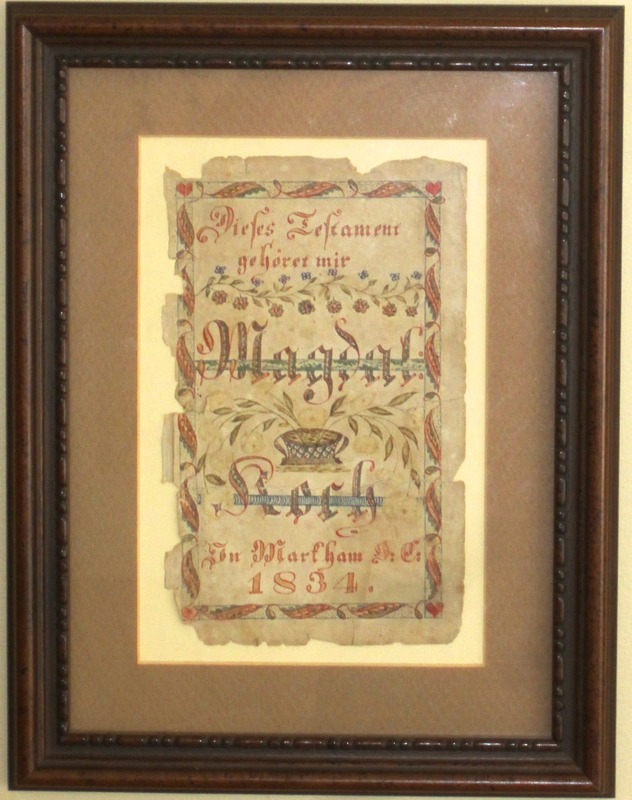 Framed fraktur bookplate illustrated in Michael Bird's Ontario Fraktur (p.138, illustration 239). At the time Bird wrote his book, the artist was unidentifed and Bird labelled him the "Greek Revival Artist." More recent research suggests that the artist was George B. Bechtel, brother-in-law of fraktur artist Jacob S. Schumacher and a schoolteacher. Bechtel was born near Pottstown, Pennsylvania in 1777 and emigrated to Waterloo in 1829. This is Bechtel's finest piece of fraktur. Other examples of his work are held by the Joseph Schneider Haus Museum in Kitchener, Ontario, and the Markham District Historical Museum in Markham. The fraktur is now framed. It has not been examined out of the frame.